Most property disputes between spouses settle before going to court. For those cases that do not, the path through the Family Court system can sometimes take many months. What happens when a party to the case wastes or exhausts marital assets during the marriage or on the way to trial? 2. A party acts “recklessly, negligently or wantonly” with matrimonial assets which causes a reduction in their value. If one party engages in behaviour which intentionally or recklessly devalues an asset, or causes financial loss, the court can deviate from its “general rule” requiring losses sustained during the marriage to be shared. We often find that one party has, either during or after the marriage, spent significant amounts of cash, or run up large debts, because of gambling or alcohol addictions. In these situations, the money is gone and the non-offending spouse faces the risk of bearing a share of these losses. An example we experienced involved a spouse who, immediately after separation, borrowed a large amount of money to buy solar panels to erect on the roof of a property. It was a very bad short term investment and produced a $500,000 loss. Our client argued, successfully, that her share of the matrimonial assets should not be reduced by her having to bear a share of this liability. 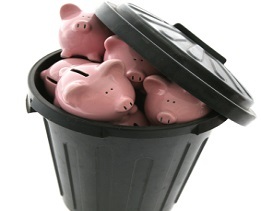 Spending money on regular living expenses after separation will not be regarded as “wastage”, and those expenses will not normally have to be “added back” to the asset pool for division with the other party. In deciding how wastage of assets will be dealt with, the Family Court has a wide discretion to enable it to resolve the matter in a “just and equitable” manner. In some instances, the loss caused by a party will be determined by the court as having to be borne solely by the offending party (as in the solar panel example). In other cases, a court may require the loss to be shared equally (such as when a gambler is found to have a diagnosed addictive illness, and is undergoing treatment). The Court can apply this approach to wastage or loss occurring either post-separation or pre-separation. In cases involving waste, we investigate the root cause of the devaluation of the asset, or the loss, to determine where responsibility should fall. If necessary, we work collaboratively with professionals in other fields such as forensic accounting, taxation and private investigation. For further information contact our Family Law Team on 9521 6000.